RW: Actually, what happened, too, when I’d won it all in high school I didn’t even remember the (100 meter) race, because I blacked out. It was the day before the race, and I’d envisioned myself running that race from every imaginable angle you could think of… and winning that race. I’d thought of the view from underground, the stands, bird’s eye view, the sidelines, every angle imaginable. I’d envisioned myself winning that race. And when the starter’s gun went off, I blacked out. And when I woke up I remember crossing the finish line. I looked up at the clock and it said 10.000 flat. That’s all I remember. To this day I’ve never seen that race. I’ve been trying to find a video of that race since 1992. I was in lane 8 by the fence, and I almost didn’t make the finals in the 100 meters. 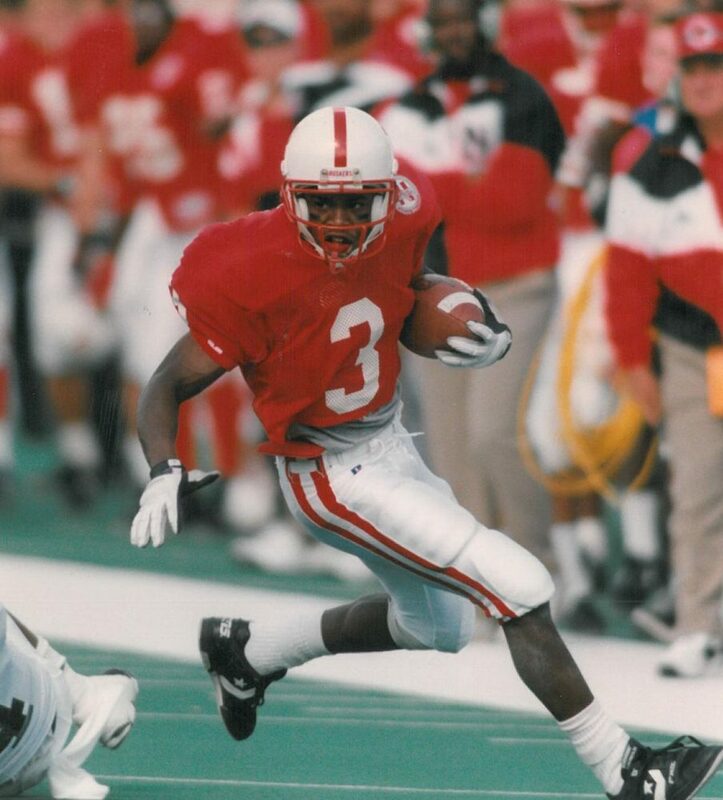 So in Nebraska my freshman year -I figured, ‘I ran it in high school. 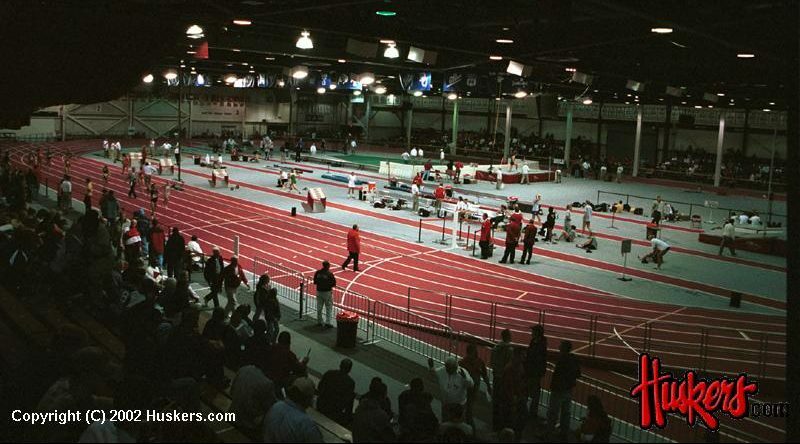 I’ll try it now’- so I have a picture of me winning the indoor 60 meters in Devaney and my eyes were closed. RW: Well, I was in a zone. So I stayed in my lane still. (laughs) One thing I do remember was doing that. Looking back, that blew my mind. The gun went off and that’s all I remember. Q: Do you have a favorite game? RW: I think the first championship game against Miami. Besides me running a reverse -because that was my claim to fame, running the reverse- to set up our first touchdown play to Mark Gilman, I remember that. But that game was a hard-fought game, a Nebraska-type game, to me. It was hard hitting on both sides; Offense was hard hitting and so was the defense. We wanted it more. I just think we wanted it more. Q: How would you know that we wanted it more? RW: I just think it was the whole preparation. The practices up to the games? It was like the quiet came before the storm. It wasn’t that, “Rah-rah-rah, we’re going to do this…” I don’t recall any of that. That song being played, “I’m tired of being stepped on…” That was being played constantly. Q: Kareem Moss brought that up, too. I’m thinking that song was about ‘the man’, the ‘system keeping you down,’ and you guys took it and said that it was a respect thing: “The national media is not respecting us and withholding what we’re due.” And the only way to counter that was to prove them wrong and beat the other team up, right? Q: Now, since you were a running back and a defensive back in high school, I take it you were accustomed to being physical and all when it came to you receivers fulfilling your duties there with the blocking? Maybe more so than the pure receivers? RW: A quarterback, right. The only true receivers we had were Reggie Baul and Abdul Muhammad. 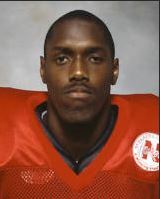 And Abdul had played some cornerback, though, too. Q: Great way to put it. So did you derive much joy, much satisfaction from knocking a guy on his can, punching him in the thigh? RW: Oh yeah, we did. Remember how they labeled us the “Itty Bitty Committee.” There was Trumane Bell, who was like 6’ 3”, but the rest of us were like 5’ 9” or less. Everybody was like 160, 135, (laughs) 145 with Vedral and Holbein. We weren’t very big, but we were all fast. RW: I think so. And I think a lot of it comes down to the kind of guys you recruit, too. My understanding is they’d recruit guys from, like, Compton, from New Jersey, from Florida, because those were like taboo spots, so to speak. Where the “bad guys” were at. RW: But then you’d go and get those ‘diamonds in the rough,’ those guys with bad-guy attitudes and aggression, but they’d also understand football and understand school. So they’d go find guys like Abdul Muhammad where he’d understand school, but he was an aggressive guy. You might have grown up where aggression was in you and football was a way to express yourself. 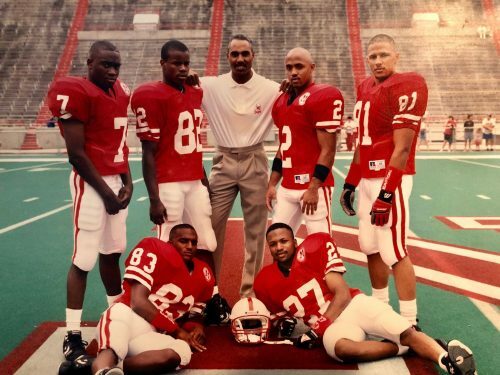 All of us at Nebraska, being a receiver, you’d get joy out of smacking a linebacker across the face or smacking a free safety or driving a corner to the dirt. That was a way to smack somebody around when you couldn’t do it any way otherwise. Q: Great point! So do you have a favorite play that stands out? RW: Besides that reverse against Miami, I did run a reverse against Missouri one year. (laughs) It was a pretty good run, and I remember just smacking the free safety and kept running until about the five yard line. I didn’t score, quite, almost got there. That was my thing, the reverses, and they were trying to use me the best way they could. Because, in all honesty, I wasn’t a pure, thoroughbred football player. I wasn’t the guy who ate, slept and drank football. I wasn’t lifting weights every day. I didn’t go out there and run hills. (laughs) I wasn’t that kind of guy. I just did what I was told, all that I was asked, worked out ’til I was done and then go home. Q: You were a speedy, natural little gazelle? RW: I just loved running. That was my thing, and that’s the way I’ve always been. Q: Interesting. What about your fellow teammates? From a leadership standpoint, did anyone bring a special ingredient to the whole dynamic? RW: I can’t really say one person. I remember so many different people. Q: Who comes to mind? Q: You know what, Riley, it was crazy that we took all of these guys from different walks of life and saw them come together in one unified run of achievement. I originally thought of it as a surprise that it happened, but the more I’m getting to understand the dynamic of it all, the more it makes sense that one needs that diversity to create a true ‘team,’ you know? We had Nebraska kids, Texas kids, Jersey kids, Chicago kids, California kids… what unique things did the California kids bring to the mix? What set them apart? Q: What do you think they meant by that? RW: I don’t know. When I first got there I talked “The White Way,” they said. And I was like, ‘What does that mean? Is it because I’m talking properly? Is it my dialect?’ Guys I’ve known for twenty-five years, you know, who were gang-bangers, even they talk proper, you know? Q: So, if you were to describe California guys in general, is there an attitude, a mindset, a unique worldview? Anything you could help define? RW: I would say, “All of the above.” The way we see the world, when certain things need to be said, the way we carry ourselves. I can’t say it was because of the weather, because the guys from Florida are about the same way as guys from Southern California. You might even say that we were more mellow, because a lot of things don’t shock us. You talk about kids our age and the football atmosphere, we’d approach things differently than maybe a guy from Texas might do it, than a guy from New Jersey might do it, a guy from Chicago might do it. I think we were more laid back, we didn’t have that same kind of aggression, per se… until it’s needed. Q: Interesting. So you’d hold back until it was absolutely necessary? RW: To me, I think coming from California, you grow up coming from a place like that and you come out to Nebraska, you’d be out here and be mellow and hang out, there’s no need to have an attitude and a swagger. We just were able to be relaxed. Q: So you were able to let your guard down. And perhaps some people read that as a lack of aggression or what have you? RW: And then, of course, they’re gonna test you. And that’s when the problems start, ‘I’m just chilling right now, and you want to come and test me? You want to take a swing at me? Push me? Say something stupid to me?’ That mellowness changes, now. Q: I’ve never heard that before. So would there be one person behind the scenes who made a difference to you or for the team, in general? RW: It would have to be our team comedian: Jacques Allen. He made guys work when they went against him on scout team. First-team defense? He’s gonna make you work. He’s gonna run the plays like it’s a game. To him, it’s work. He was a comedian on the team. That guy was super-funny. He’d get Osborne laughing in the meetings. He’s a special guy. Q: Do you keep in touch with Jacques anymore? RW: I know Abdul keeps in touch with his parents, but I think it’s been about six years now. If you have his number, give it to me. Yeah, I’ll give him a call. Q: Riley, yours was a very unique experience. Last question: would you say you’re a better man as a result of those experiences? The university experience? RW: I think it definitely gives you some resolve… that type of mentality. 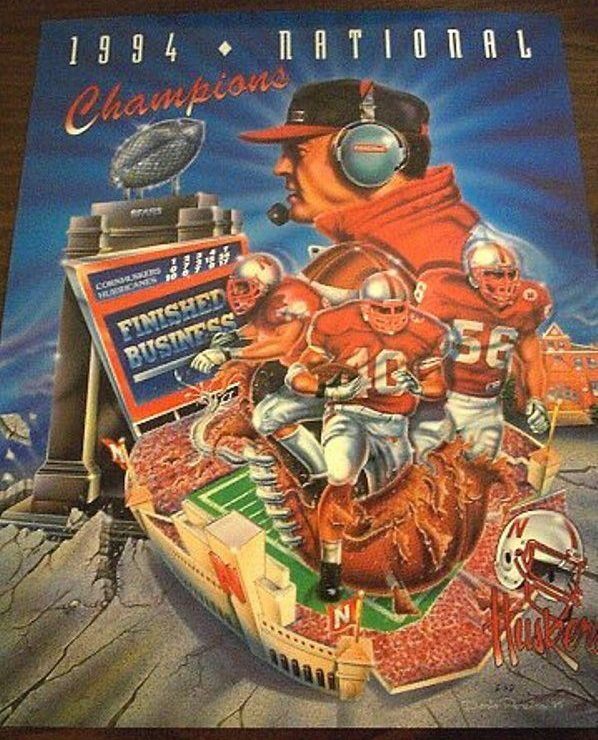 You know, as far as Nebraska Football, you don’t get to the top just by accident. You have to work for it. And it takes some special kids out there -and that’s far and few between- so most kids come in and redshirt and put in their time and get playing time and so forth and so on. When you come, you come and you want to shine. So that resolve and that patience, I would think, is what matters. You have to have patience. Q: Allow the process to have its way with you? And when you finally do get your time to shine you’ll be ready to grab hold of it? RW: Right. Stay focused, stay ready, and stay positive. Other than the oft-mentioned eminence outliers and inliers on staff, the positive, influential levity of Jacques Allen, the joker, had its influence on the whole organization. Perhaps a result of the darker days Riley had experienced, Jacques may have been the antidote to his melancholy; or maybe the lighter side of the college life was a refreshing respite from the long hours of practice, preparation and homework for the entire team. I guess we can all use a few laughs to lighten the mental load now and then, can’t we? Like Darin Erstad stated earlier: “It takes all kinds.” Jacques was a funny kind of fellow: the right kind at the right place at the right time. And once again, the fan fervor seemed to make a great impression on this non-Nebraskan, proving how their support played upon the young athletes’ psyches of that day: “What caught me at first was Autograph Day at the stadium. I saw fans that came out -it almost scared me a little bit- because fans knew so much about me…” I always thought it odd that the annual Football Media Guide produced by the Sports Information Department was called such, as the Big Red devotees snatched them up with gluttonous glee. It should have been called The Fan Guide. Then to top it all off, you had the actual Saturday morning Game Day scene: “..when I was entering the stadium for our first game… riding up to the stadium on the team bus and I’m seeing people out there on walkers moving with ten gallon hats, red hats with N’s on them, walking to the stadium. I was, ‘This is like ten in the morning! And people are here already?! … In droves! …it was everybody from every age group, it seemed like. There’d be moms rolling in, and old people, wow. 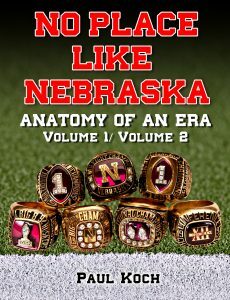 And then people drive from six, seven hours away to come to a game?” Being a long-time participant in the Nebraska Football experience, it’s easy to forget about the scarlet spectacle and pageantry and camaraderie that happens on fall campus Saturdays. Riley brought it back to life for me, as if an 8 year old seeing it again for the first time. Thank you, my friend, for the memory.